It’s crucial for start-ups to know who uses their application and how. 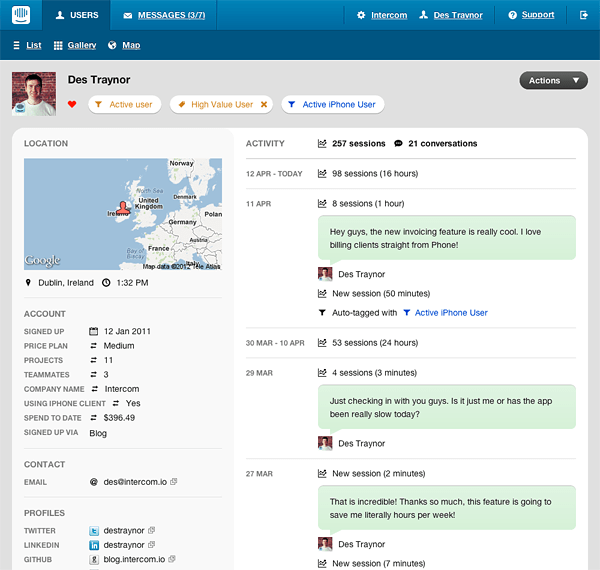 One of our goals with Intercom has been to surface this information, and have a single authoritative screen that tells you everything you’d like to know about a customer. Today, we launched that screen. Who is this? – A VP in IBM, or a student in Bristol? Have they been using the app lately? Have they seen our latest announcements? What sort of user are they? Has anyone spoken with them recently? What was the conclusion of the last discussion? You can group customer information loosely into four categories: profile data, business data, activity data, and communication data. If you don’t have all four, you’ll always be in a weak position. You will end up wasting time in lengthy support discussions with students on your free plan who will simply never pay, or sending marketing mails to customers who haven’t logged in in months, or seeing that a CEO or very influential person has signed up and hasn’t received any attention whatsoever. None of this is desirable and all of this is preventable. You simply need to stop thinking in silos. When your customer information is scattered across different data stores, it encourages thinking in silos. You put on your marketing hat and blast out marketing emails, the support team are busy closing support tickets, and someone else is busy calculating your AARRR numbers. The thing is all of this data is connected. Sending marketing messages to someone with 3 open and unanswered tickets will cost you a customer, resulting in 1 less daily active user. It’s all connected. 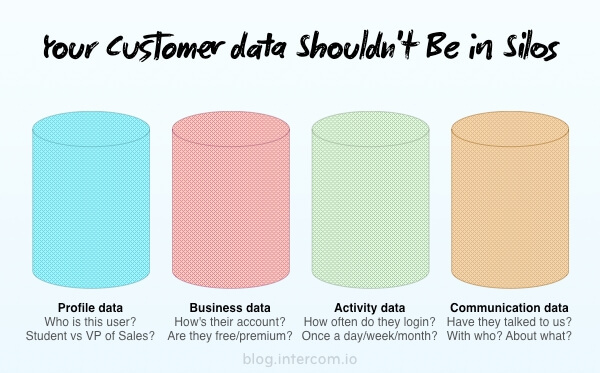 Siloed data costs you your customers, and leaves you clueless as to why you’re losing them. Getting related data together pays off disproportionately well. In the same way a good dashboard can save hours by merging data sources (letting you see commonalities), a good customer profile paints the perfect picture of a customer, letting you know everything you need to know. As our user profile screen is one of the key screens in Intercom, it has been through many iterations. Here’s what’s we’re launching today. But I already have that data? Sure you do. You can grep your log files, query your database, search Google and skim through your support app, and then your emails. You can do this for every customer you want to talk to, but you don’t. Not because it’s not important, but because it’s simply too time-consuming. Obstacles upstream propagate downstream. Because you don’t have time to do this, you can’t communicate well. Because you can’t communicate well, you do it badly, if you do it at all. What we’re doing in Intercom is making this process of researching and communicating easier, by an order of magnitude. When you achieve this level of reduction in time or complexity you make new ideas possible. When it takes just a few clicks to ask all active premium users how to improve your reporting (while they’re on the reporting screen), then that changes things. Easy access to instant targeted in-context feedback takes a lot of guesswork out of the equation. It changes how you design. As Bill Buxton noted at UX London this year, the remote control changed the television industry. Removing the effort of changing channels caused the networks to have to synchronise advertising or lose their viewers. Of course people could change channels long before remote controls, but it just wasn’t easy enough to do regularly. Good customer data supports good proactive communication. We have long believed that targeted timely communications are the path to loyal happy customers. Unless you have everything you need to know at your fingertips, you’re not in the right position to communicate. Don’t confuse proactive communication with customer support. Good customer support involves reacting well to problems as they occur. The thing is, most customers don’t report problems. Instead they just shrug their shoulders and assume that you already know about that bug, or don’t have that feature, or don’t really care if they’re jumping ship. Your support tickets only represent a fraction of what’s actually going wrong for your customers. To find the rest you need to actively reach out to them. You need to get to know them.